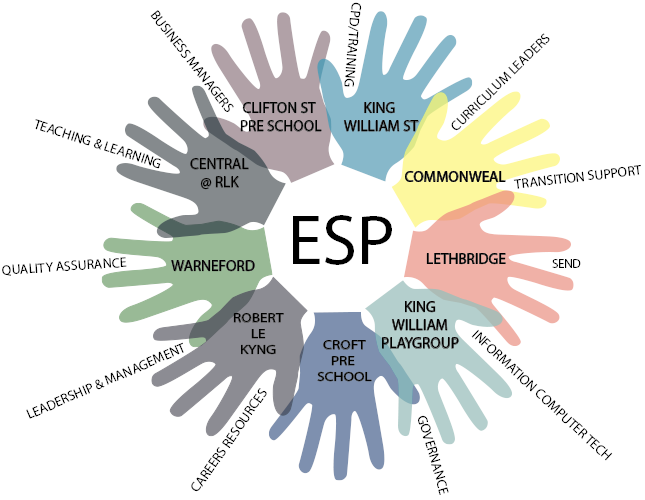 The Education Strategy Partnership (ESP) is a group of 10 local schools who work collaboratively in the best interests of students in the Swindon area. We are committed to improving learning outcomes for over 3000 students on roll in the 10 schools, across all educational phases. There is very little in the way of formalised bureaucracy or superfluous administration and the only financial outlay for each of the schools is a modest contribution to the costs of an Education Strategy Partner. The Partner is responsible for co-ordinating, planning, recording and celebrating the annual programme of activity. The core business of the ESP focuses on strategies to improve teaching and learning, but we recognise that to achieve this the well-being of the whole school needs to be nurtured. Thus, there is a good deal of CPD work related to supporting other key stakeholders to directly impact on outcomes. We are not a Multi-Academy Trust.